Nowadays it seems even the big corporations want to make the shift to a more entrepreneurial culture. So we put together a companion to The Barefoot Spirit just for the C-Suite. 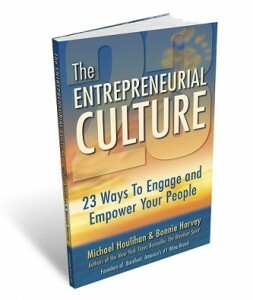 It’s called – you guessed it– The Entrepreneurial Culture, 23 Ways to Engage and Empower Your People. We will be announcing it this week with several media appearances in New York, including the taping of a new TV show run by Jeff Hayzlett (the former Chief Marketing Officer of Eastman Kodak) called C-Suite TV. We are very excited to have our new book launch coincide with the launch of the C-Suite TV and C-suite Book Club in early September. We saw a great cartoon recently where a haggard employee was sitting at a bar after work, complaining to the bartender, “Sure they want me to be creative and innovative, but I’ve got a career to think about!” One of the chapters from The Entrepreneurial Culture suggests entrepreneurial compensation to solve this problem. Use performance-based compensation, and share the wealth. Allow us to be blunt: we don’t think that set salaries are a great idea. When you have a compensation plan based on an hourly rate, you’re paying for attendance, not production. Regardless of how much they do or don’t accomplish, your employees will have an “I was there, pay me!” attitude…and can you blame them? Instead, our experience has shown us that performance-based compensation is better for everyone– you, your employees, and your company as a whole. For salespeople specifically (and to a lesser extent, sales-support people), we offered a small base salary and told new hires, “The more you sell, the more you make. There’s no limit.” And in order to ensure that our employees didn’t ease off when they felt they were making “enough,” we set up an increasing incentive, so each step—though harder—would be worth a lot more than the last. Here’s an example of how it worked: If someone sold, say, 100 cases in April 2000, and 100 cases in April 2001 (these numbers are unrealistically small for simplicity), their commission would be the same in both years. But if they sold 10 percent more – 110 cases – they would get $1 for every case over that 100, or $10 more. At various points, we were chastised by other businesspeople who felt that we were “overpaying” salespeople. This was partially due to the fact that several of our top salespeople made more than we, the owners, did! Yet when we looked at the numbers, we knew we were doing the right thing. Our unorthodox compensation system didn’t stop with our salespeople, either. Performance-based pay also applied to our sales support-staff (i.e., everyone who wasn’t a salesperson). In addition to their salaries, these employees received bonuses based on quarterly sales. At first, many members of our sales-support staff were skeptical. For example, one bookkeeper claimed that it wasn’t fair to be paid a bonus based on quarterly sales because bookkeepers could not affect sales. Turns out, that claim wasn’t entirely accurate. Here’s what happened: Soon thereafter, one of our salespeople got a last-minute meeting with “Mr. Big,” a supermarket chain buyer, at 8:00 AM the next morning. And because the bookkeeper in question knew that his bonus would be affected by the sale, he made sure that the salesperson had all the necessary reports by 7:00 AM. Needless to say, our salesperson came back to the office with the purchase order. Here’s another example of how pay-for-performance motivated our sales-support staff. One day, a gentleman walked into our reception area wearing an aloha shirt and Bermuda shorts. Although he appeared to be on vacation, this man was checking out our wine display and everything written on the walls. Our receptionist, who knew that her bonus was based on sales, proactively asked the visitor if he was a wine buyer. When the man shared that he was actually a big wine buyer for a 30-store chain in the Southwest, our receptionist immediately introduced him to our national sales manager. And because this wine buyer was relaxed, on vacation, and in discovery mode, he ended up putting our product in all of his 30 stores! You can bet that our receptionist really savored that particular quarter’s bonus. Overall, performance-based pay really helped us grow, and best of all, the increased “pay” was “found money” that cost us nothing.Plus, we reduced turnover, which is the #1 hidden cost of doing business. Think about it: when members of your team leave, you don’t just lose those employees; you lose their hours of training, their institutional knowledge and their relationships outside the company. In the case of salespeople, you can lose customers who are more loyal to your former employees than the product they represented. Plus, it can be costly to look for and train new candidates. Basically, our compensation system meant that producers couldn’t afford to leave, and non-producers couldn’t afford to stay. Meanwhile, we constantly attracted new go-getters who were willing to bet on themselves. It’s simple: How you treat your employees directly correlates to how successful your business will be. If you treat them like a commodity—if you’re stingy with pay, recognition, and benefits—they’ll do only the bare minimum to keep their jobs, and eventually, they’ll leave. We suggest you use performance-based compensation, too. Yes, every company and every industry is different, but if it’s possible to earn profits, it’s possible to tie those profits to your employees’ salaries and bonuses—and we guarantee that you’ll see results! Sharing the wealth never looked so good!